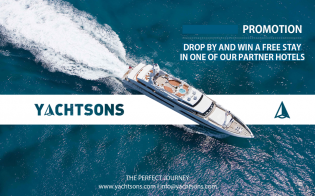 Yachtsons announces first Mega Charter Fleet in the Maldives – Superyachts News, Luxury Yachts, Charter & Yachts for Sale. Yachtsons, a Maldives based Yacht Agent is commencing the first charter fleet in the Maldives. Yachtsons along with one of its legal entities, Isle Vacations is now no the move to assemble the largest Safari fleet as to take a turning point in the industry. Acquiring access to 7 unique local-built safaris which rates from 4 to 6 stars will bring about an overall change in Yachting Industry of the Maldives. “The concept is quite simple. We are assembling a large fleet of Safaris as to generate momentum within the industry. It is predictable that this industry is still at an infant stage in the Maldives. In order to explore the rest, we need an aggressive strategy development and alterations focused beyond our borderlines. Operating such a fleet is quite a challenge, but we see the potential in the sector.” Announcing their proud project, the Project Coordinator Mr. Jazlan Ahmed further mentioned about their remote operational structure. As per the information provided by Yachtsons, the inspections phase of the vessels is now underway to guarantee a safe journey to charterers. Their destination line is expected to reach Sri Lanka, India, Seychelles and Thailand. However, the expansions are quite accessible just as bigger and better Safaris are now being built at a large scale. “Its again a challenge that what we have here is limited in size. We often find safaris of 120 feet. But there’s a change of trend in terms of size and sophistication.” Reaffirming their announcement, Mr. Jazlan Ahmed further indicated that the fleet will not only boost the visiting Yachts, but the in-house Yachting and Cruising will also be subjected to a change which is in need of a major over-haul. “The project will be managed by Isle Vacations, which is a legal entity of Yachtsons. We have the operational structure finalized. The feasibility assessment has shown a lot of potential for this in our region.” Added to this, Mr. Jazlan Ahmed said that the project may take 6 months to become fully operational. The project is aimed at attracting more Super and Mega Yachts to Maldivian waters as it currently shares only 3% in the Travel and Tourism sector. The idea of assembling a Safari fleet is a major break-through in the Maldivian Yachting Industry as Maldives is now fasting it’s belts to develop the country’s first ever Yacht Marina in the newly reclaimed area of Hulhumale. The Marina is estimated to accommodate over 50 yachts at once. Upon concluding the project, Yachtsons will be able to operate the fleet in the Asia Pacific region assuring the first outbound cruising experience beyond Maldivian waters.